Happy humpday, Big Hungries! How’s 2012 treating you so far? I had my Miss America viewing party over the weekend, welcoming about 10 ladies into my home for yummy treats and wine, and am happy to report that Miss New York came in second runner-up to Miss America, who is from Wisconsin! So proud of the way Kaitlin represented us out in Vegas, spreading her passion for an end to bullying in our schools, and impressing everyone with her intelligence, grace and talent. Go New York! I’m left with a house in need of cleaning and a blog in need of a food review. And I have a good one for you this week, folks. While I was hoping to tell you about the Binghamton area’s only Korean restaurant Man Nam, we had a wee SNAFU there on Saturday that left my review incomplete. Undaunted, Melinda and I ventured out into the balmy January night yesterday to sample the wares at the new The Loft at 99, in downtown Binghamton. This sleek, contemporary space opened about two months ago on Court St., and if the scuttle at my salon is any indication, is causing a stir in the right direction. Our first impression was good. This narrow but spacious wood-dominated space is gleaming, while still being warm and inviting. We chose to be seated in the loft area of Loft, because it seems like seats near the window might be chilly, and let’s face it: Court St? Not exactly a scenic view. But the view from the loft platform was really nice – looking out over the bar, you feel the expansiveness of the height in the restaurant. It was a little dim for photography. Dim enough that the table of ladies next to us took out a flashlight in order to view their check. Also, there’s no salt or pepper on the tables – a sign of a confident chef who knows his flavors are there and doesn’t want his patrons messing with them. Our bottle of wine, a Chilean sauvignon blanc called Natura, was bone dry and punchy with acidity, a fantastic foil that stood up to all the zest we were about to order. We started with two appetizers: the baked polenta cake with braised swiss chard and garlic, and grilled tenderloin caprese. Right out of the gate, we were impressed. The polenta has tremendous texture, with none of the mush so often present in restaurant polenta presentations (ahem, Moxie). The greens were mellow and the roasted whole cloves of garlic were sweet and fragrant – this was savory in excess, without the heft. 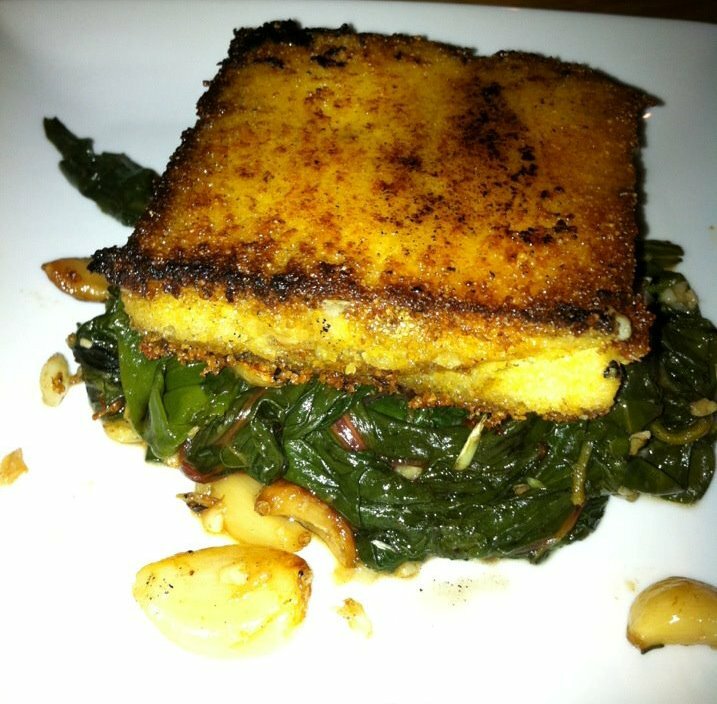 The dish was so different than your typical starter, assertive in flavor but light in hand. 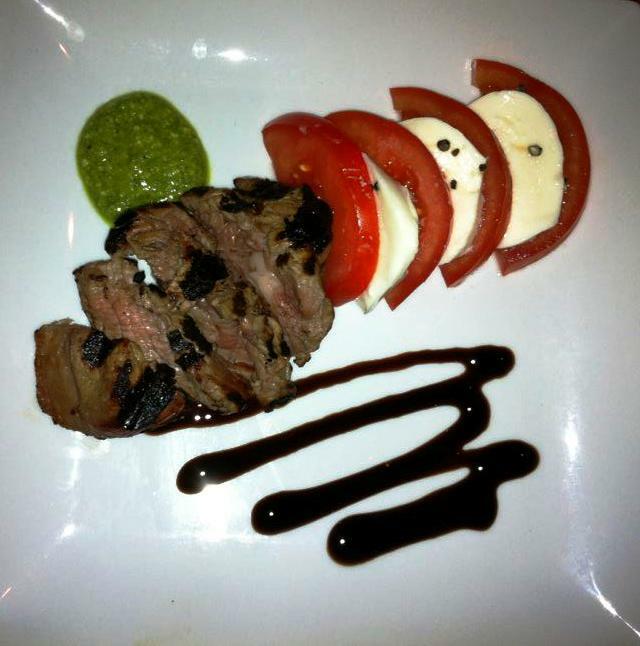 The grilled tenderloin accompanying the caprese salad was terrific – tender and lightly smoky, with good beef flavor. The caprese was very straightforward, with roma tomatoes and fresh mozzarella, but the balsamic reduction smeared on the plate was done really well, syrupy and sweet. The basil pesto on the other side was fine and pretty ordinary. I confess, while creating the perfect bite of tenderloin, tomato, cheese, and two sauces made for a delicious mouthful, I was surprised at how straightforward this presentation was. From the menu description, I thought maybe the beef would be stacked with the tomato and mozz, perhaps, or maybe the tomato or cheese would be marked off on the grill along with the meat. What was nice about this interpretation was that the beef was warm while the salad was cool, which was a nice play on the palate. The entrees were only slightly less successful. I was absolutely psyched to order the slow cooked pork shoulder with “pinch” buns and asian-style condiments, while Melinda struggled a bit before deciding on the orechietta with pesto cream sauce. 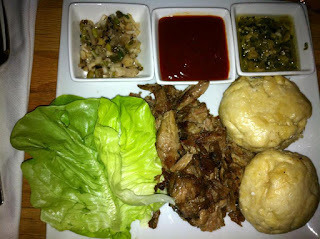 My dish was impressive at first sight: a mound of pulled pork shoulder, lettuce cups, two snowy-white dim sum buns, plus a thin ginger-scallion sauce, a thick soy-tinged BBQ sauce, and a chunky mélange of picled onions and mushrooms. As it tends to be, the pork was lush and rich. The BBQ was fantastic, tangy with soy and spicy as well. The pinch buns, as the menu called them, were lumpy counterparts to what you get at dim sum palaces when you order pork buns – steamed, bland, a mere vehicle for all of the other flavors. The only downfall here was the pork itself – it was good, but not great. As a girl who went to college in North Carolina, and counts braised pork shoulder as one of her favorite dishes to make for a crowd, I was disappointed with how stringy and greasy the meat was. It was as if the pork was undercooked a bit, left to sit in its own cooking liquid, then flat-top reheated in that fatty liquid. And for $21, a dish with a protein as inexpensive as pork shoulder should be flaw-free. 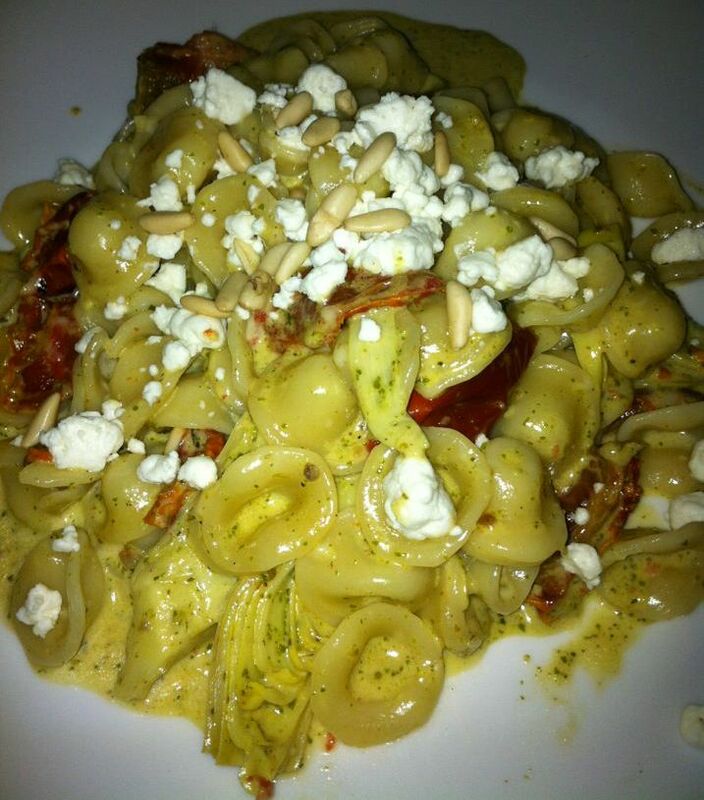 Melinda’s pasta, little ears of orechiette, was shrouded in a gentle pesto cream sauce and crowned with pine nuts and goat cheese. The artichokes in the mix were a fresh addition, and were excellent. The sundried tomatoes, a little 1997, but fine. The goat cheese was creamy, decadent and luscious, but completely overpowered the pesto, which is a bit of an issue when the dish is billed as a pesto dish. A lighter hand with the goat would balance this dish a little better. It was delicious, and worth ordering, but not exactly what she had expected. We finished on a high note with novel and yummy desserts: buttermilk panna cotta with pistachios and pomegranate seeds, and cinnamon sugar donuts with vanilla mascarpone cheese and apple butter. The panna cotta couldn’t touch the pumpkin version I had at the culinary institute last year, but it was light, creamy and tangy with the unique flavor profile of the buttermilk. 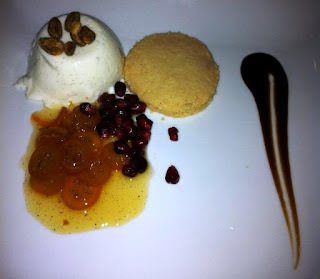 The pomegranate seeds and pistachios on the plate, as well as a smear of what might have been a sour cherry gastrique, were cool, unique accompaniments. The preserved cumquats we liked less, but for citrus lovers, this would have been a great palate cleanser for the meal. 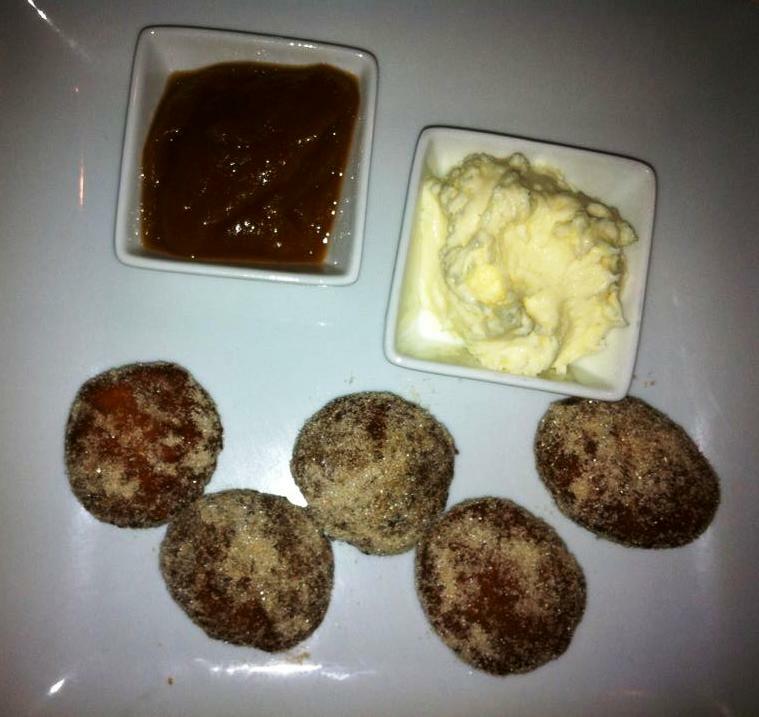 We preferred the cinnamon donuts, wich were soft and warm, completely elevated by the thick, outstanding mascarpone cheese whipped with vanilla, and the cool apple butter. Heaping the two toppings on each bite of donut was like biting down into a fresh, glazed apple firitter, but better. I should add I ordered a side of mashed potatoes with my entree which were superfluous, appetite-wise, but strong nonetheless. They were chunky and skin-on, replete with loads of butter and heavy cream. Very satisfactory. Our final score was a 7.5 on the BHS scale. I would absolutely add The Loft at 99 to my list of must-eat places in Binghamton, but you need to expect somewhat trendy food for prices above what some in this area will like paying for such fare. I will add that portions were generous – you won’t leave here hungry. But while the appetizers sort of knocked our socks off with their inventiveness and assertive flavors, the entrees didn’t quite deliver the same impressive flair. The Loft is close, but a little more fine-tuning is needed before I’m going to award them a cigar. It’s a simply fabulous atmosphere, and would be tailor-made for girls nights out or office dinners on the town, but for serious foodies, there are some minor flaws. Join me on Twitter @BigHungryShelby for all the juicy details on where I’m eating in this New Year, and sign up for our Big Hungry Shelby group on Facebook for expanded content and random thoughts. How are you liking the new digs, by the way? I hope you’re enjoying the look and feel of my new Blogspot home! My personality is big, my hunger is bigger! The polenta dish was really stunning, Lori. I have a bag of chard in the fridge right now, and some Anson Mills grits in the pantry. I have half a mind to tinker around with this for dinner tonight. There had to have been cheese in the polenta, but I couldn't tell what - maybe a locatelli? It was salty and savory without being overtly cheesy, and there was so stretchiness to it when you cut into it. The cinnamon donuts were delicious!! I don't think they photographed very well (they kind of look like meatballs). I can't wait to go back and order a martini and sit downstairs on one of the very comfy looking couches.